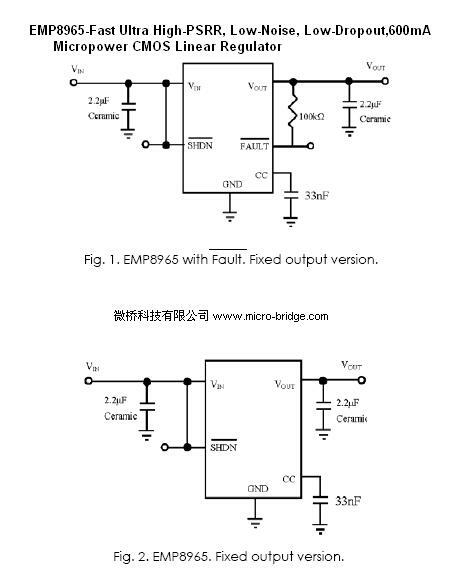 The EMP8965 low-dropout (LDO) CMOS linear regulators feature ultra-high power supply rejection ratio (75dB at 1kHz), low output voltage noise (30μV), low dropout voltage (270mV), low quiescent current (110μA), and fast transient response. It guarantees delivery of 600mA output current, and supports preset output voltages ranging from 1.2V to 3.3V with 0.1V increment (except for 1.85V and 2.85V). The EMP8965 is ideal for battery-powered applications by virtue of its low quiescent current consumption and its 1nA shutdown mode of logical operation. The regulator provides fast turn-on and start-up time by using dedicated circuitry to pre-charge an optional external bypass capacitor. This bypass capacitor is used to reduce the output voltage noise without adversely affecting the load transient response. The high power supply rejection ratio of the EMP8965 holds well for low input voltages typically encountered in battery operated systems. The regulator is stable with small ceramic capacitive loads (2.2μF typical). Additional features include regulation fault detection, bandgap voltage reference, constant current limiting and thermal overload protection. Available in miniature 5-pin SOT-89-5 package options, SOT-23-5 and SOT-23-6 package options are also offered to provide additional flexibility for different applications. EMP products is RoHS compliant.